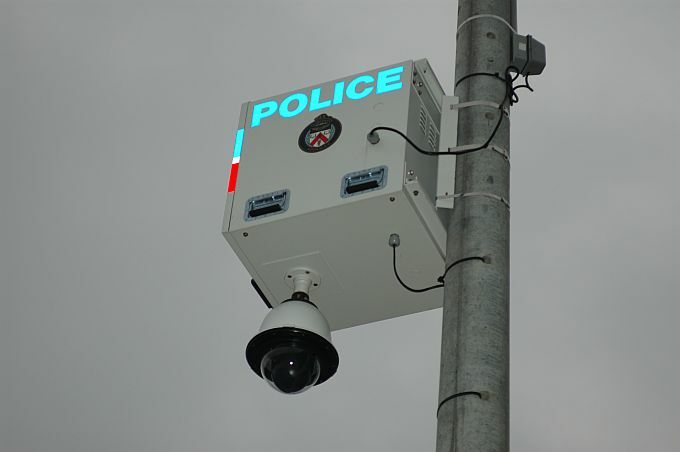 Fortress Of Freedom Board :: View topic - Police Cameras - Do They Work? Police Cameras - Do They Work? Posted: Fri Oct 05, 2007 6:47 pm Post subject: Police Cameras - Do They Work? 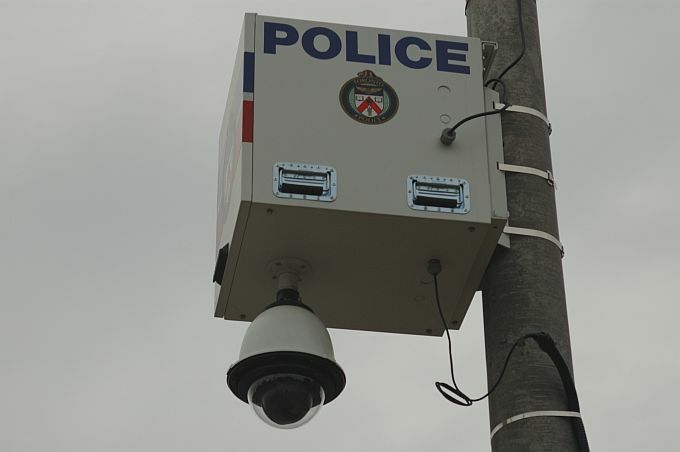 A Toronto Police Video Camera! You see them now in many big cities. A rarity and invasion of privacy at one time. We are talking about police cameras. I have always been a big supporter of individual rights. The rights of the individual must triumph, so I was rather dismayed at the apathy to the police initiative here in Toronto to start setting up cameras in crime riddled communities. 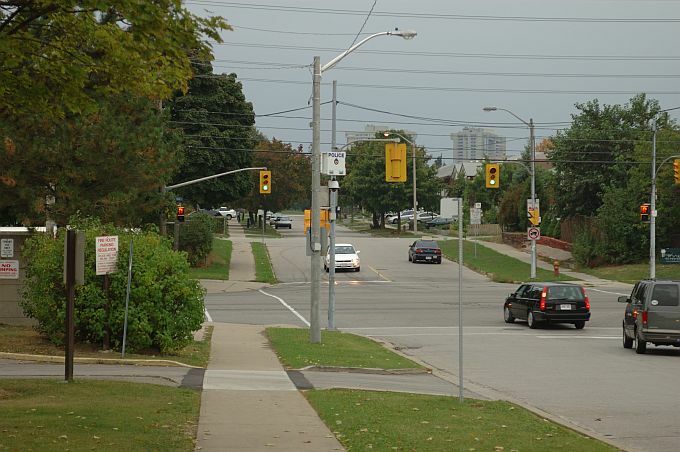 One such site is at Victoria Park and Morcambe in the north end of Toronto. It seems a fatal robbery happened at the strip mall on the north east corner and it just so happens that public housing is located around this business establishment. One could argue that there is a socio-economic bias to monitoring low income residents, but that seems to fall on deaf ears...even among low-income residents. The cameras will deter and prevent crime they say; so I improvised a test to see if it was true. Wide angle shot of the street, see if you can spot the camer. 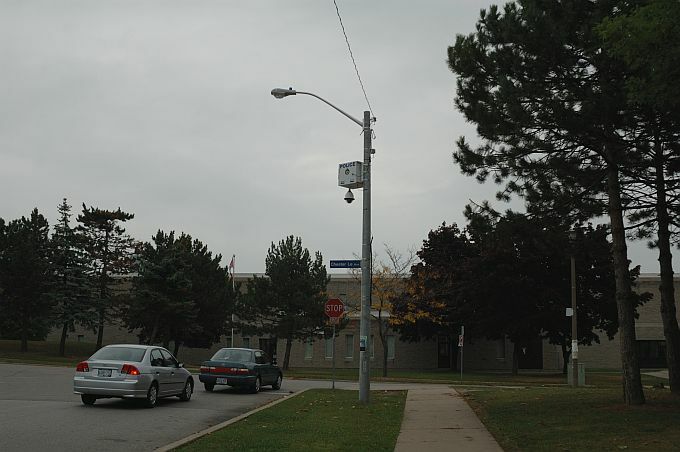 I decided to hang around the cameras at that site and take photographs at the cameras and then hang around the east camera which is right across the street from a public school. I would time the event just incase the police came to check me out. At this time I should mention just how wary I was at doing this test. I parked my car on another street just incase I had to make a run for it and did not want to be identified. Think about it, if I am not doing anything illegal, then why such trepidation? Constant monitoring by the police seems to do that, just like being in a police state..... This was one of the biggest surprises when attempting this demonstration of mine. I never really felt that way before just standing on a street corner. Well the experiment begins. I set my stopwatch and made for the first of two cameras with the police logo proudly displayed by the camera. I took several shots right at the cdamera as you can see. I mulled around and walked up to the other camera by the school. I took shots at that one and mulled around. After five minutes I left. No police! Was anyone watching? I crime could have bee committed and there would have been no response. Or were the police waiting for a 911 call first, then why the camera in the first place? So ended that demonstration. By the school, nobody was concered about a man mulling around a school with a camera? The first is that those cameras do not prevent anything from what I can see. I do not believe they are manned, maybe they have video. If so then they will not prevent crime but only possibly aid in arrest; little compensation to the victim. The question then becomes one of whether the invasion and loss of freedom in our everyday lives is worth a possible aid - not for crime prevention - for lazy police work as opposed to traditional methods of investigation. Many of the businesses have their own private cameras in the stores and out, so what is the purpose of those large cameras just on the sidewalk? It would seem to be simply a deterrent or intimidation tool. Note the highly reflective decals as I shot this with a flash! Personally, I feel that the effect on the general public is a far more onerous thing than any possible benefit in crime fighting. If you don't believe me, then go to one of those locations and look right into the eye of that camera.....how does it feel?